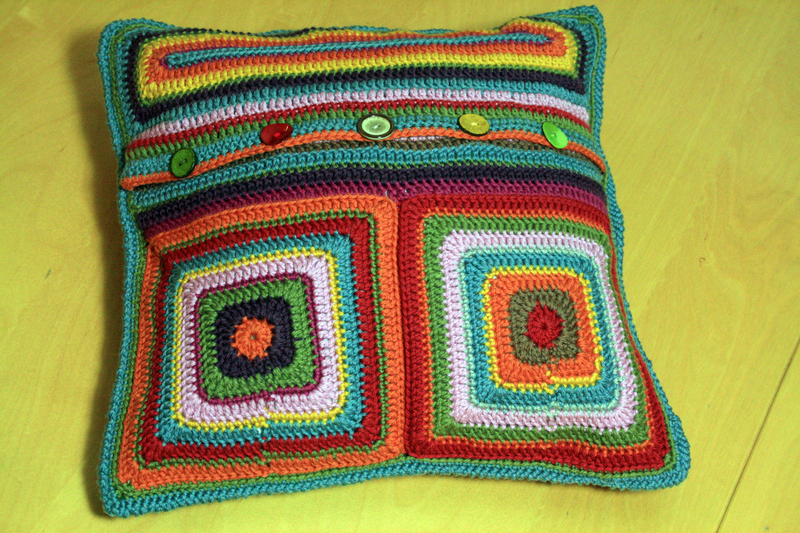 Funky and floral scatter cushions for the home. 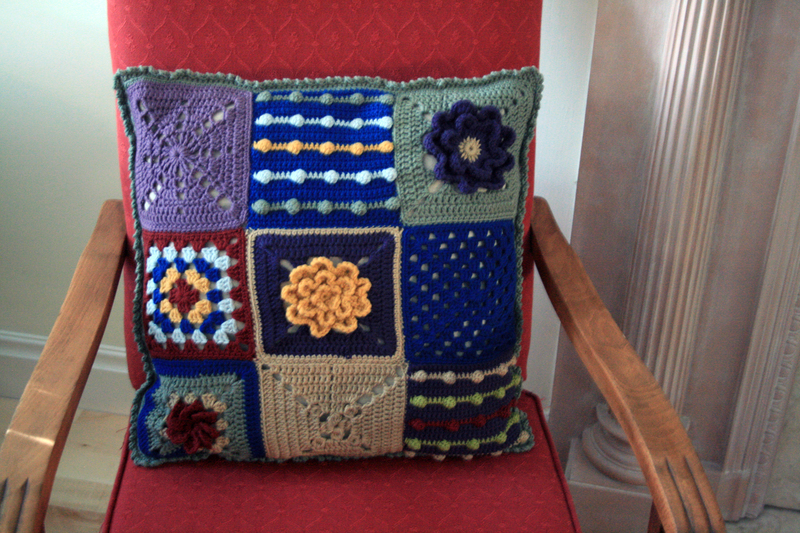 I am so happy that I have at last finished my floral cushion . 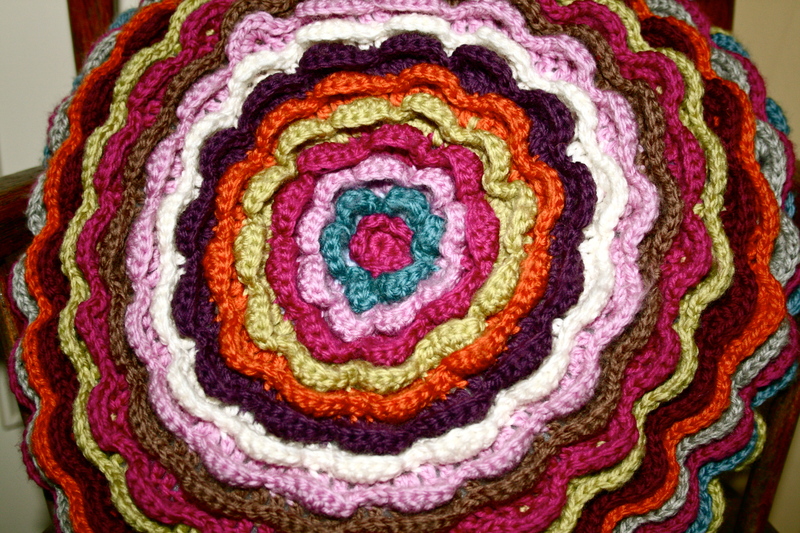 The pattern does show how to join them as you go but I could not decide on a colour sequence, so I just used to make them in between other things and when I was on the go. It was just easier to make one and drop it into the collection. 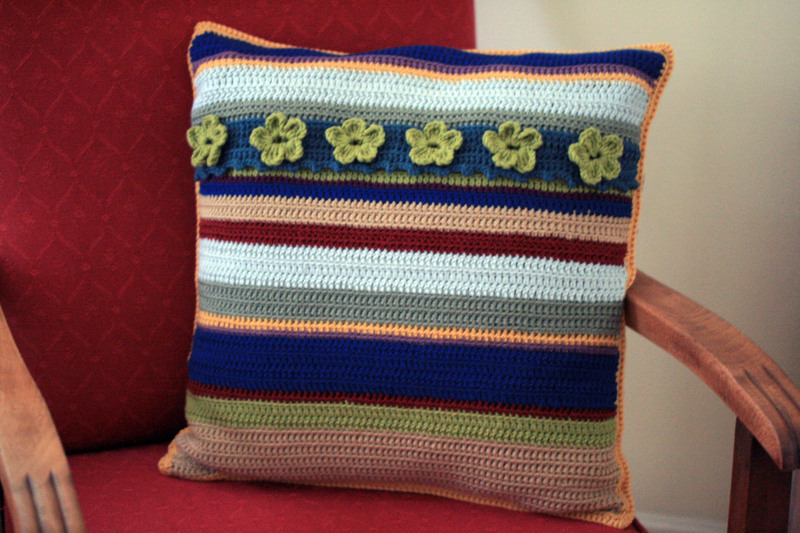 Once I decided they would become a cushion cover and I started pinning them onto a cushion to guide me on the colours required. Then the joining process began, it did not take long for me to realize the error in my method. It has taken an absolute age to join all these little flowers together although I have to admit that it is totally my own folly. 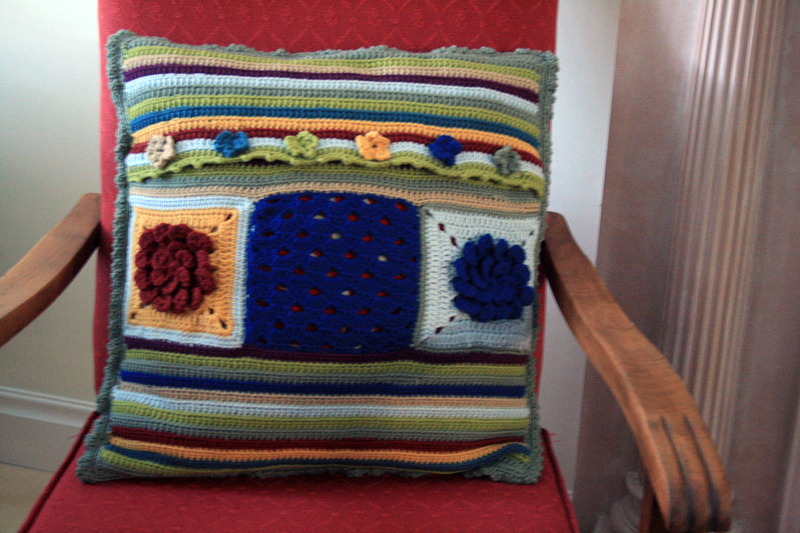 For the back I made two squares and an oblong using multi coloured stripes. Using the oblong to overlap and held together with 5 different coloured buttons. 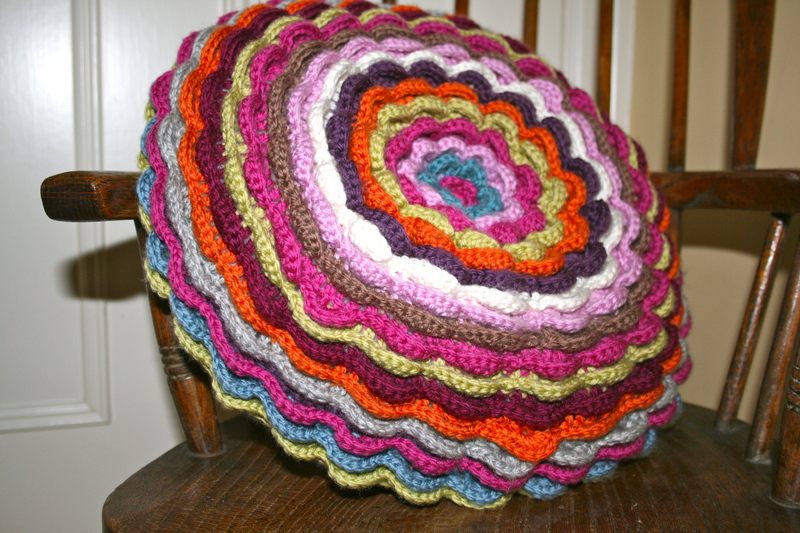 I totally love this pattern by. I will definitely use it again, only this time I will follow ALL of the instructions and join as I go. 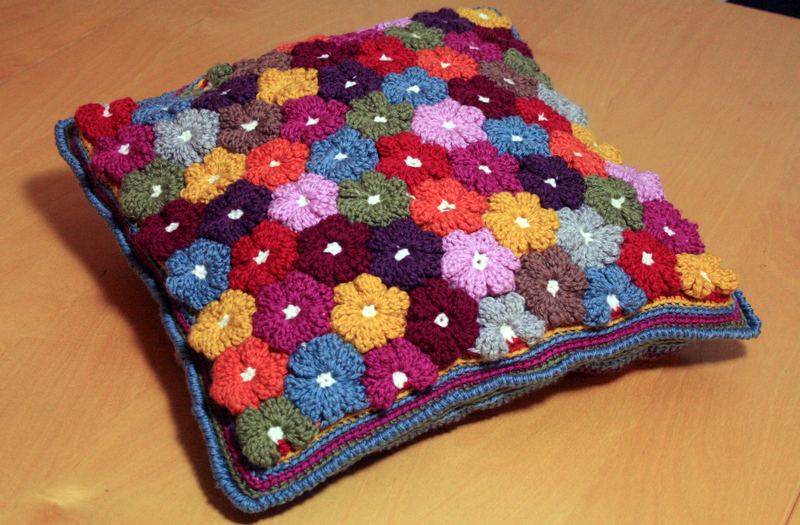 The pattern by Adi Keren for these lovely flowers can be found here. 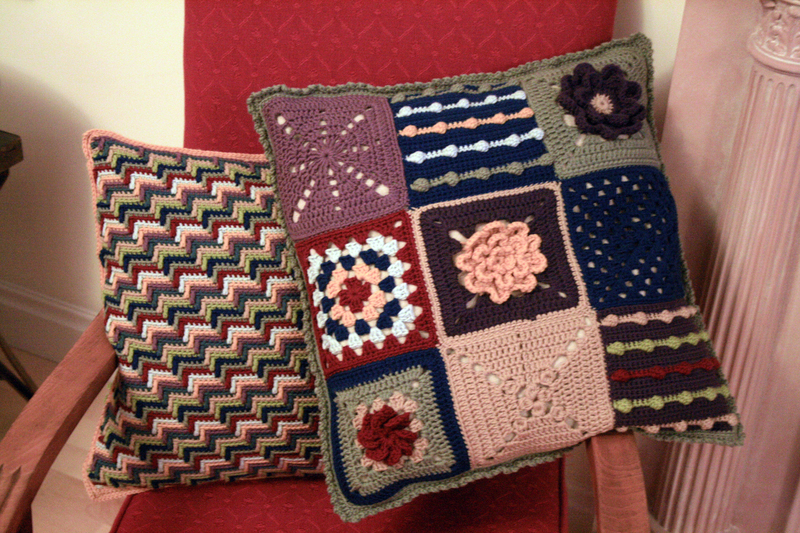 You may remember that I had some squares left over from making a blanket for my lovely Miss L and I decided to use them to make a cushion. 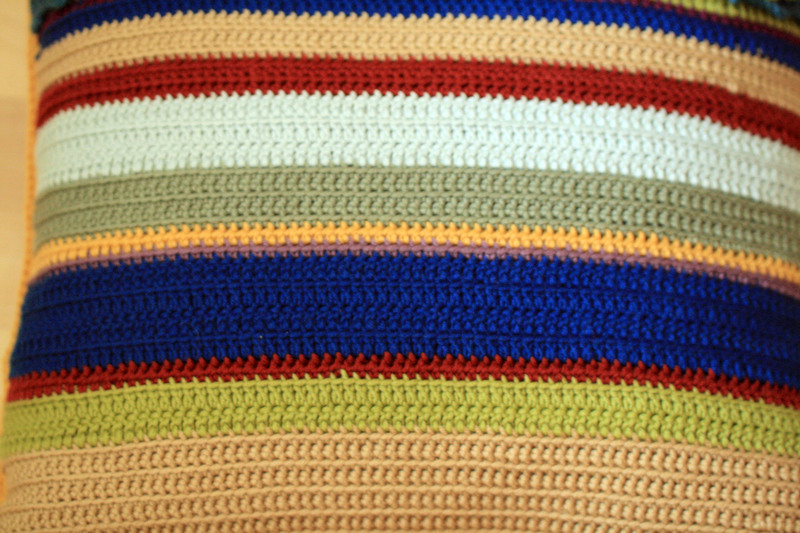 And as I still had a few squares to use I worked them in along with the stripes for the back. 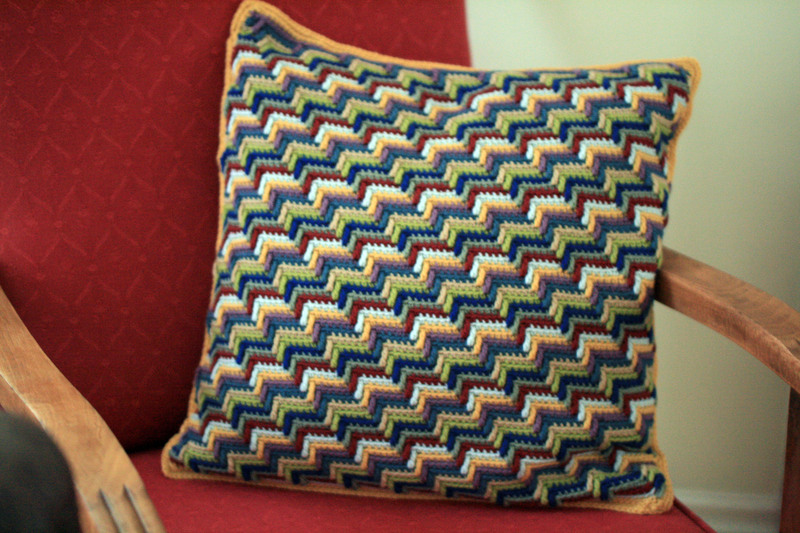 I originally started this project a few weeks ago when I discovered the Apache Tears pattern by Sara London which ended up being a cushion in it’s own right. 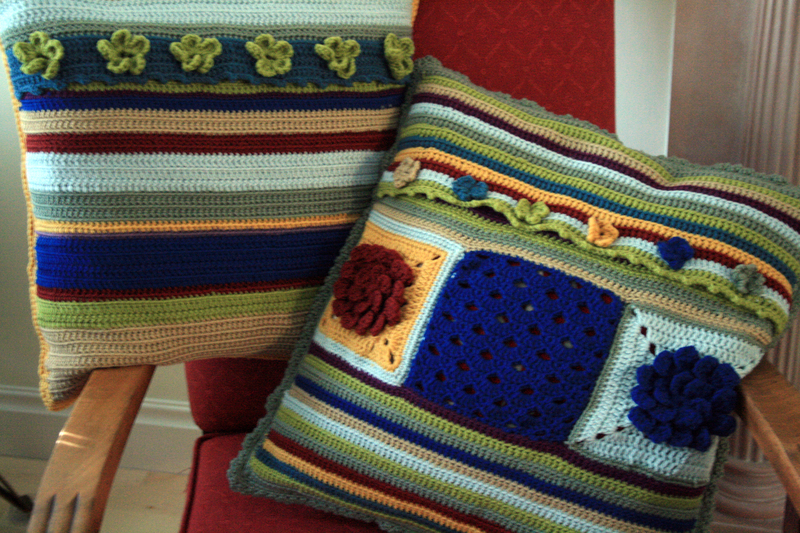 It made sense to make them into a pair so the stripy back matches the apache tears cushion. 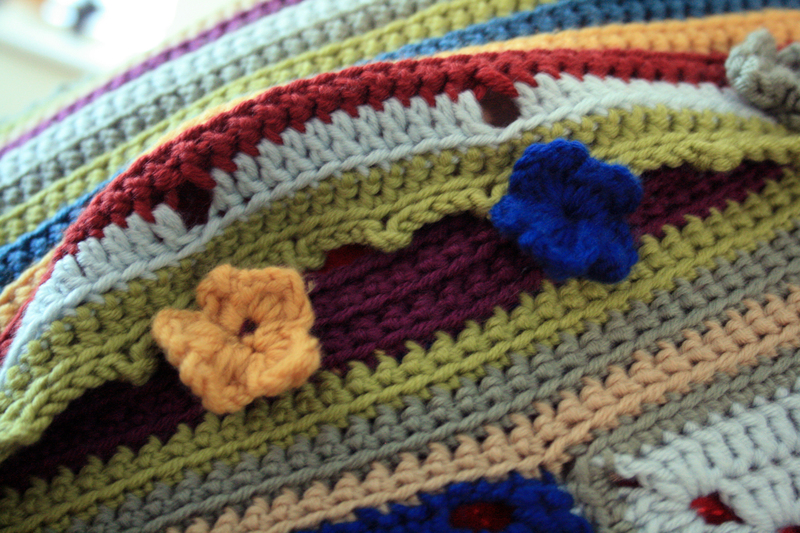 And to keep the pairing I used a similar pattern to make the flower buttons. 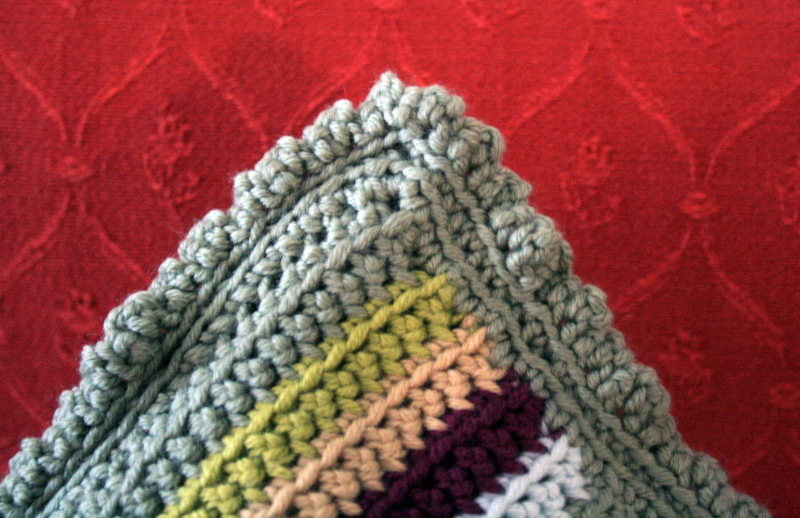 And finished with a simple edging. I am very happy with how this pair work together. Or using the face of the stripy backs. The pattern for these gorgeous little flowers was found purely by accident one day whilst perusing Ravelry, and what a great find, aren’t they cute. It’s not easy to show in the images but the way they are made gives them a great depth and texture. 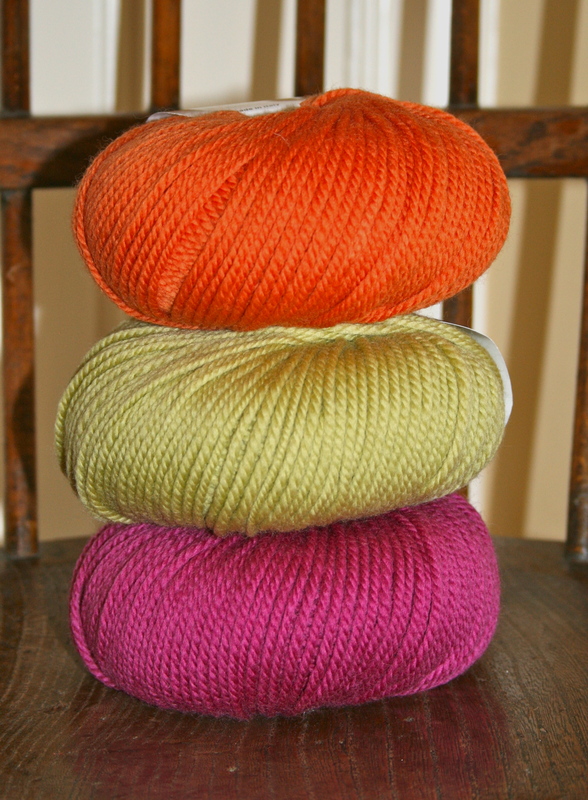 They are great for using up scraps too, I am using Rico Essentials Soft Merino Aran scraps that I have left from making our daughters blanket last year. 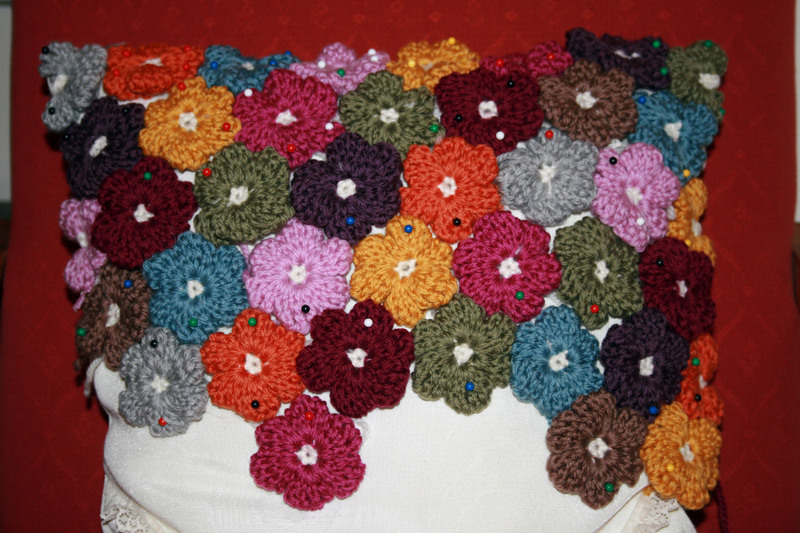 The mistake I made was not following the instruction in the pattern about joining the flowers together as I went, I just merrily went on my way making them all individually and pinning them onto my cushion. 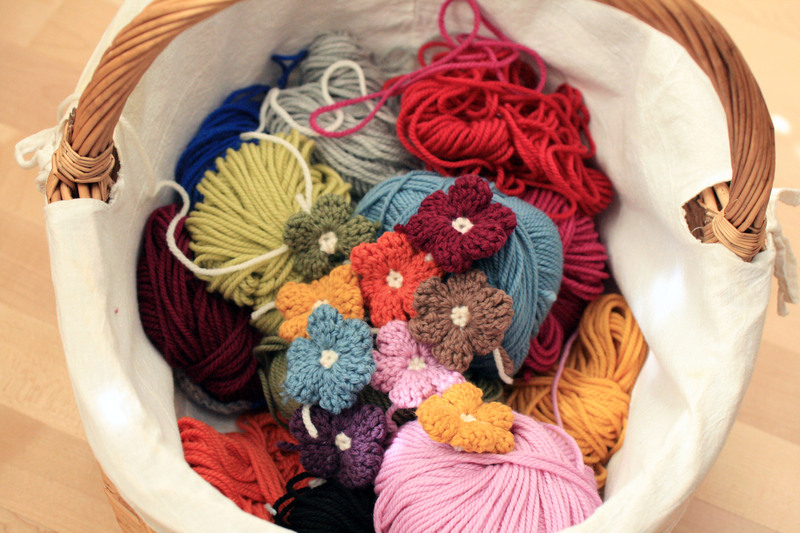 I wanted to be free to arrange and re-arrange the colours. No problem, or so I thought. I would simply sew them together at the end. Oh dear, I definitely do not recommend this, it is taking me ages! It will be worth it in the end I am sure but it is not a mistake I would make twice. They do look good but as you can see I do have a way to go yet. 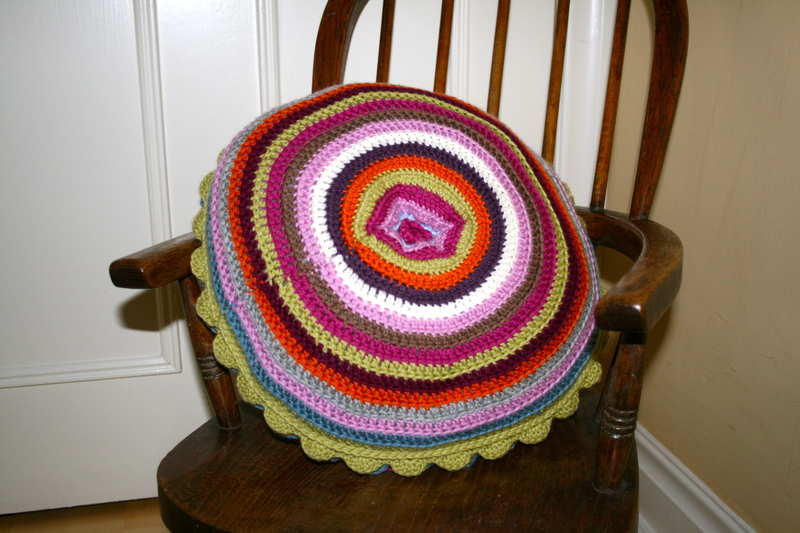 The pattern is by Adi Keren available on Ravelry here there is such a lovely story behind it too, Adi along with other members of the family made flowers then Adi brought them all together to create a gorgeous blanket for her nephew. She explains that between them they used scraps in blues and greens in a mixture of yarn types and weights, this added even more texture. Found a great blog and I just had to share this with you! 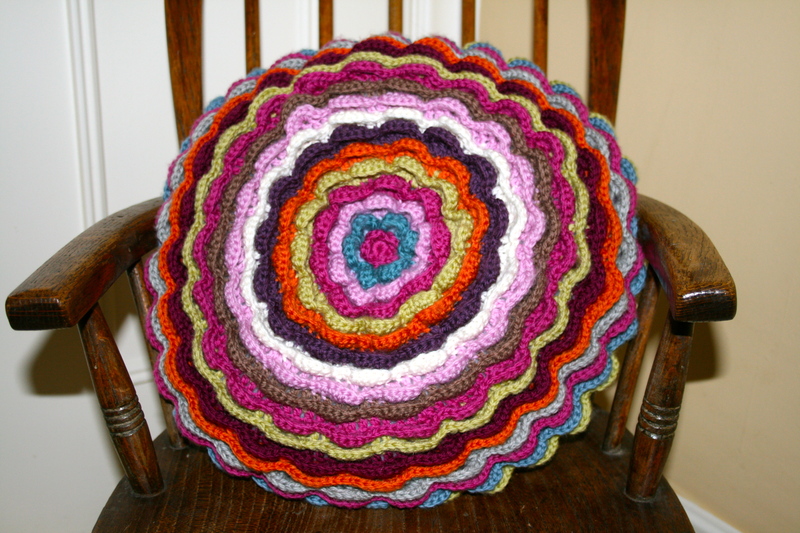 During the rainy weekends of late I have been spending a bit of time online and came across this website/blog attic24.typepad.com/, the first thing I saw was the image of the website author Lucy holding a beautiful cushion. I was thrilled to find that there was a tutorial provided so it was just a matter of getting started as soon as possible. 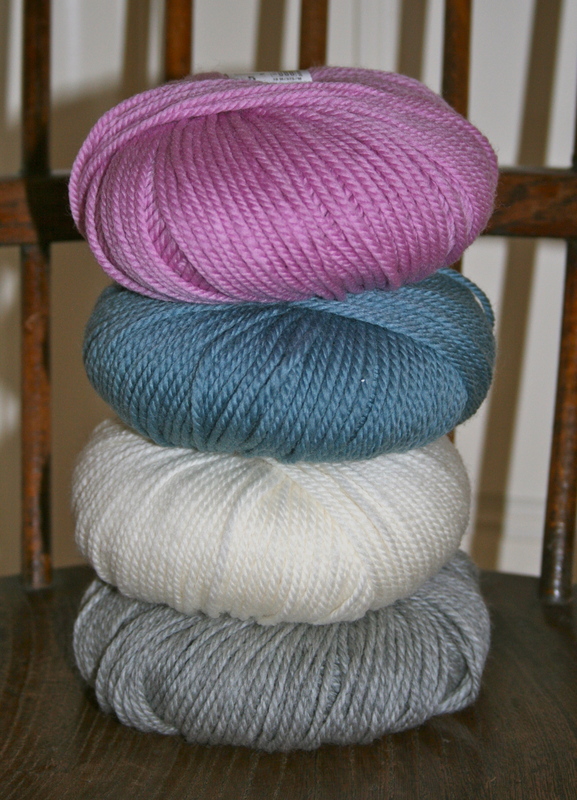 Now very grateful for his intervention I am using his selection from the Rico Essentials Soft Merino Aran range as follows. I picked out these darker shades as the base. 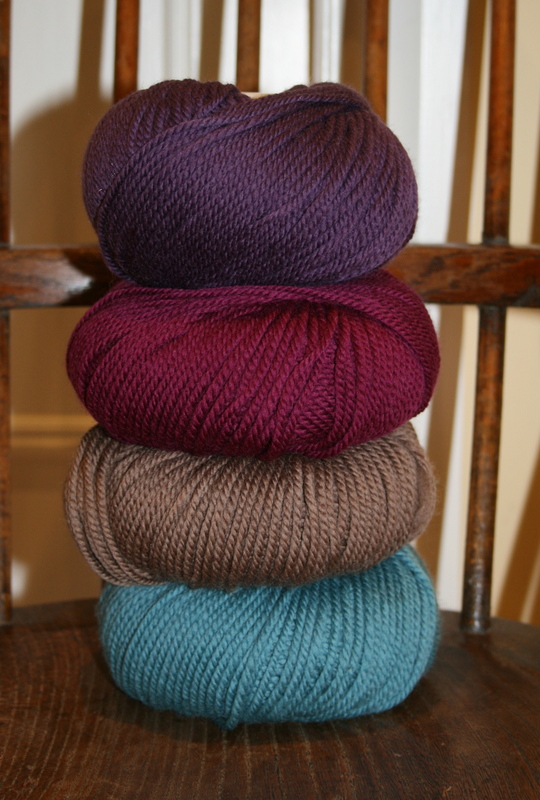 These lighter shades to balance out the base colours. 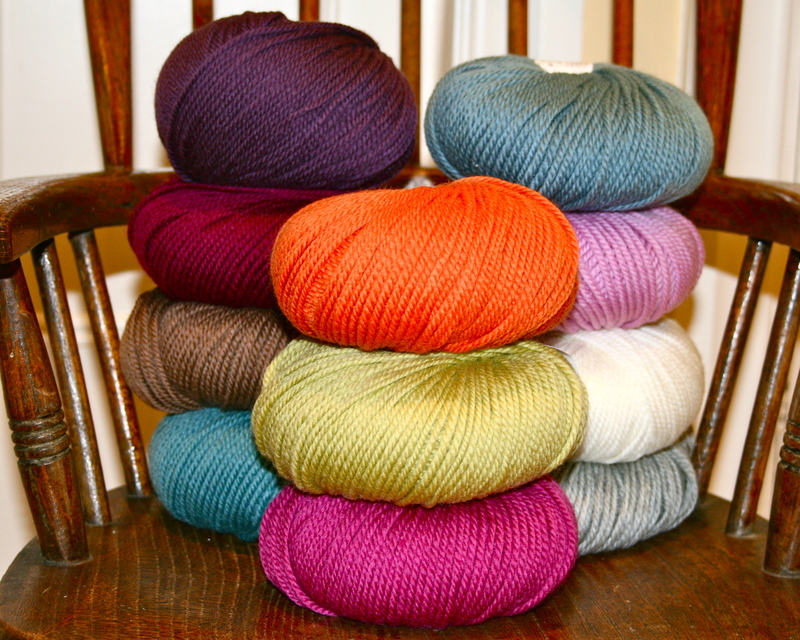 And these lovely brights to add some zing! Here they are altogether. Don’t you think they look scrumptious? 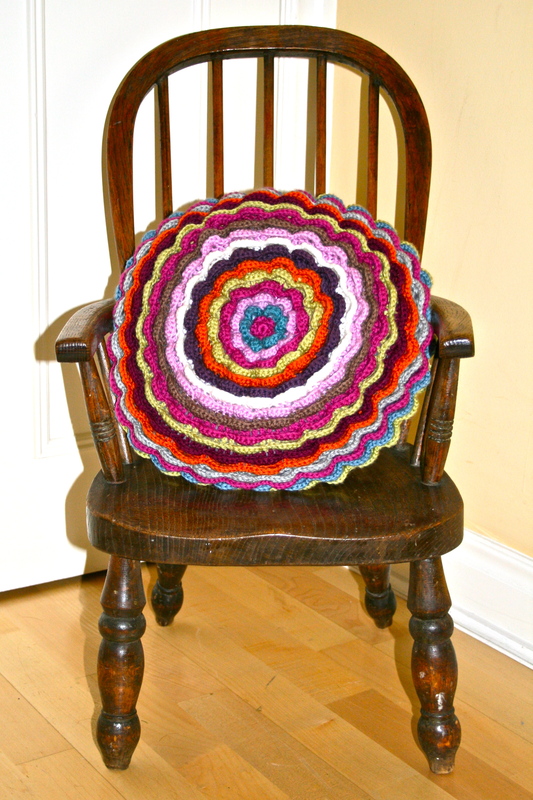 The finished cushion on my little wooden chair, I am really very pleased with it. 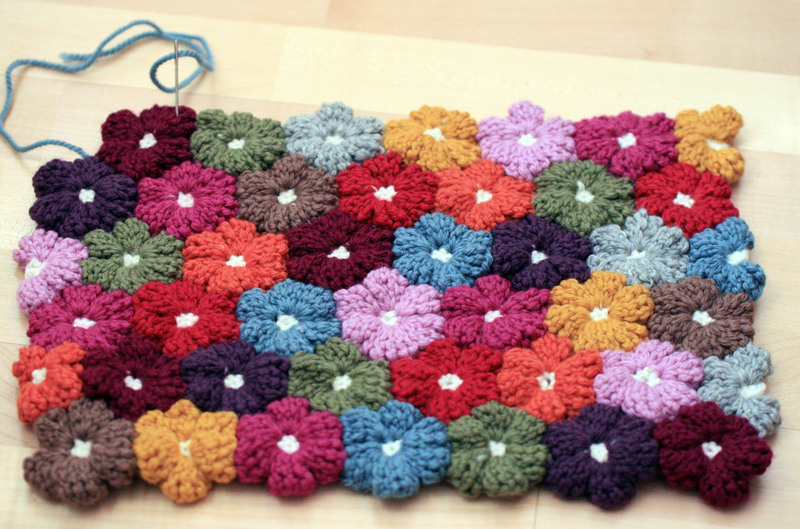 The pattern is very clever using both the front and the back of the stitches to form the petals. 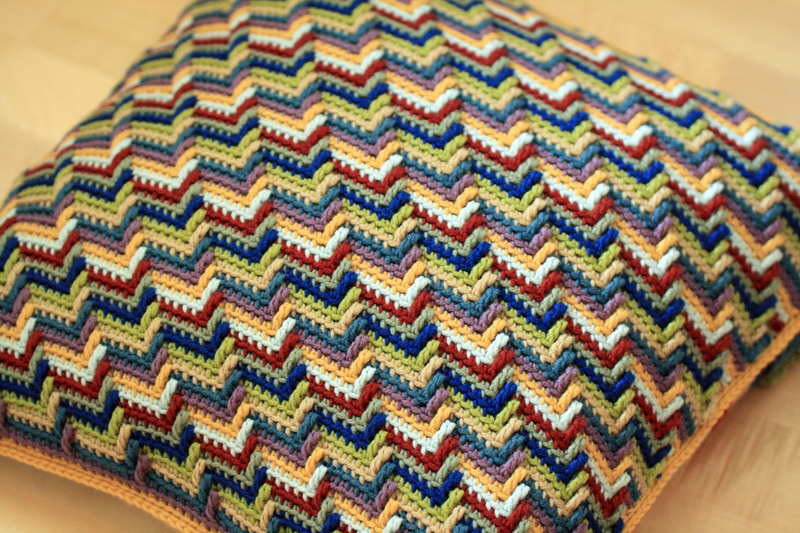 The tutorial for the pattern is really clear and easy to follow with lots of pictures so you can check at every stage that you are executing the pattern correctly.